The new and improved Remington 597 magazine! 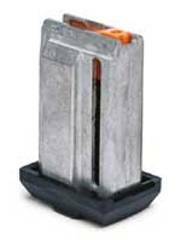 The original plastic ones were prone to splitting so Remington has developed a metal one. Holds 8 rounds of .17 HMR or .22 Magnum (aka.22 WMR). Eliminated many jamming problems in my gun and will actually hold the claimed 10 rounds (unlike the plastic mags).